Lloyd Alexander, a prolific writer of children’s books including the five-book series “The Chronicles of Prydain,” died Thursday. He was 83. Alexander died at his home in the Philadelphia suburb of Drexel Hill, said Jennifer Abbots, spokeswoman for his publishing company, Henry Holt Books For Young Readers. He had cancer, she said. 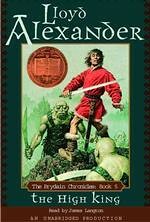 The final book in his Prydain series, “The High King,” won the Newbery Medal from the American Library Association in 1969, being recognized as the best children’s book of the year. Another book in the series, “The Black Cauldron,” was named a runner-up for the medal in 1966, a status now known as a Newbery Honor Book. His final novel, “The Golden Dream of Carlo Chuchio,” is scheduled to be published by Holt in August. The publisher described it as an adventure in the tradition of Middle Eastern folk tales. Alexander joined the Army at the start of World War II and got much of his training in Wales. His experiences in the area inspired many of his books. He met Janine Denni, whom he married in 1946, while attending the University of Paris. She died two weeks before he did, Holt said in a statement. Well, it has been more than the “shortly” in which I indicated my comments/thoughts would be forthcoming to be sure. Part of the delay was due to business (kids, work, house, stress, sleep, health…). Such is life, I suppose. Another part of the delay was due to my deep sadness to hear that Lloyd had passed. Let’s be clear, I was not on familiar terms with Mr. Alexander, but I felt that I knew him (or an important part of him rather) through his works. Both in a literary sense, and in a inspirational capacity (in terms of role-playing games), I am deeply in Lloyd’s dept.